Royalwood™ Wallaba shingles and shakes — a Custom Shingles exclusive — is the premium choice in wood roofing for discerning homeowners and anyone else who values durability and beauty. Wallaba roofing can be found throughout the world, and is especially prized in luxury resorts in the Caribbean and other tropical regions, in part because of its superior resistance to the effects of moisture. We offer Royalwood™ Wallaba shingles in a range of sizes and configurations to meet the needs of today’s demanding builders. Browse our website to learn more, or contact our office directly to request a quote. 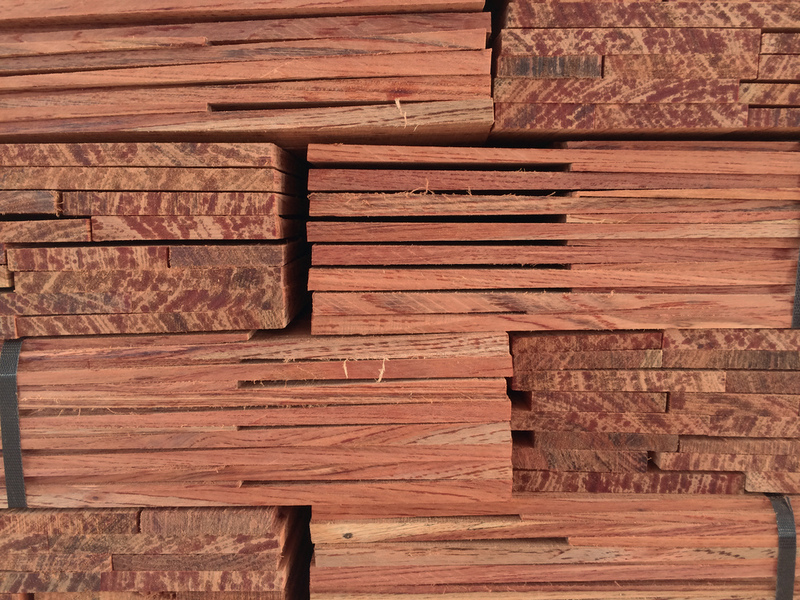 Wallaba is a hardwood grown and harvested throughout the northeast corner of South America, with Guyana, Suriname and Brazil being the largest suppliers. It is notable for its color, density and naturally occurring resins that protect against a number of potentially damaging factors. 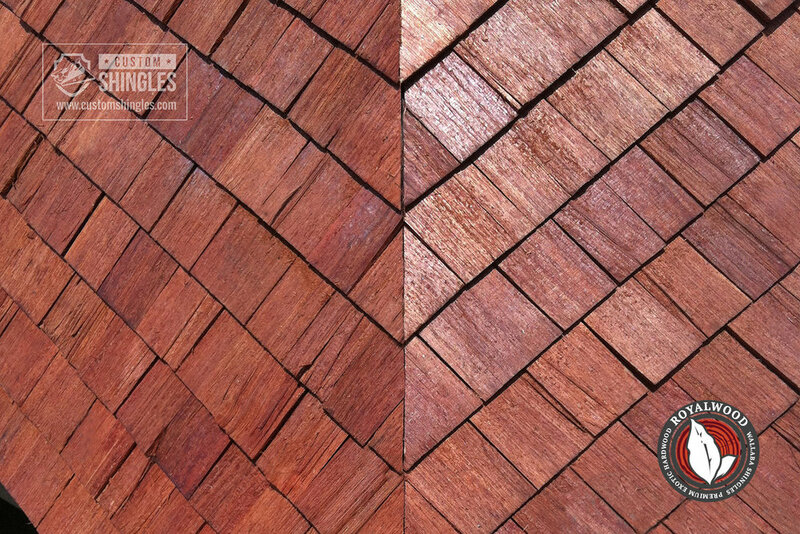 It has a coarse texture and a relatively straight grain, making it an excellent choice not only for shingles, but also for fencing, flooring, decks and more. Color: Royalwood™ Wallaba features a gorgeous deep red color, which matures over time to a stately silver. In fact, one of the driving motivators behind homeowners choosing Royalwood™ Wallaba roofing materials over other premium options is the color that they simply fall in love with. But, that said, the beautiful color is only the beginning of the many benefits of choosing custom Wallaba shakes for your home’s roof. Resistance: Royalwood™ Wallaba includes natural properties that simply can't be beat for roofing materials. Indeed, the type of resistance that Royalwood™ Wallaba offers is resistance that you would have to add treatments to other roofing materials to achieve. Specifically, Royalwood™ Wallaba offers exceptional resistance to fire, decay and insects — all without the use of chemical treatments. Durability and Ease of Use: Many roofing materials are heavy and difficult to carry and install. Many of those same traditional roofing materials leave much to be desired in strength and durability — especially in significantly hot or cold environments as well as during thunderstorms and other natural challenges. But Royalwood™ Wallaba is lightweight, strong and durable, with each shingle or shake lasting 40 years or even longer. Low Maintenance: Many custom wood roofing solutions require significant maintenance to remain mold- and mildew-free. But that’s not the case with decorative Wallaba shingles and shakes. When you choose this unique custom wood roofing solution, you’re choosing a material that is going to last for years to come, as well as one that is going to require the bare minimum in maintenance over that lifespan. 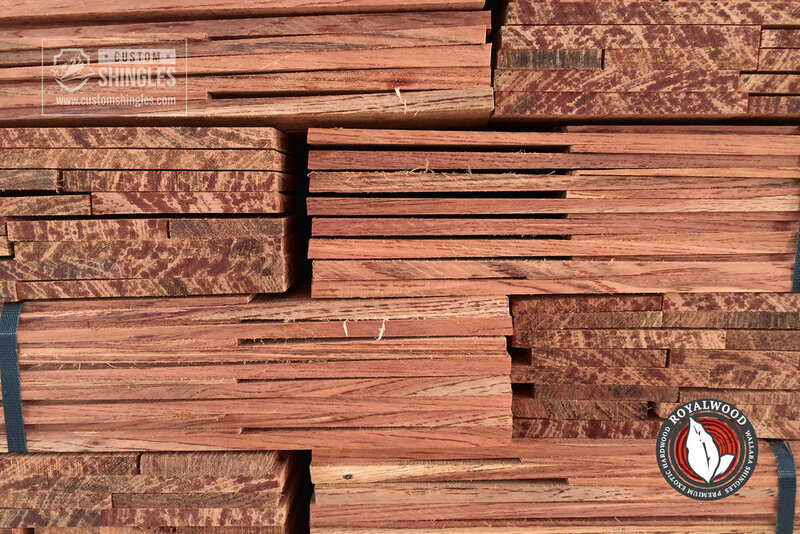 Our Royalwood™ Wallaba shingles are milled in Guyana using locally sourced, 100% clear heartwood. We take care to ensure all trees are sustainably harvested. Because Wallaba is so abundant in the region, it’s possible to meet consumer demands responsibly, without artificially inflating our prices. Depending upon the order customization, additional finishing is performed in our Florida facility, where we exercise the highest standards of quality control to ensure you get a product that meets your demanding requirements. Royalwood™ Wallaba shingles and shakes are typically sold in 18” lengths, though custom-cut products are also available. We offer several decorative profiles, including dragon’s tooth, diamond, fish scale and other popular choices from the Fancy-Cutt™ product line. In most cases, we require a minimum order of 2,500 square feet. Royalwood™ Wallaba shingles are used by builders and architects around the world who require a premium product at an economical price, that stands out from the surrounding environment. In addition to supplying Royalwood™ Wallaba shingles, we can also work with you to oversee their installation or solve any other engineering and design challenges you face in the process of bringing your vision to life. Check out photos of some of the projects we’ve worked on previously by visiting our Wallaba Gallery page. As mentioned, color is the primary benefit that most homeowners fall in love with. But they begin to swear by specialty Wallaba shingles and shakes when they discover their long-lasting performance, even in the most extreme conditions — Wallaba shingles and shakes can often be counted on for at least 40 years of use, but many more on some other occasions. But not just any roof installer can unlock the beauty and durability of Royalwood™ Wallaba. You need an expert service professional who is knowledgeable about Royalwood™ Wallaba and experienced with installing it. At Custom Shingles, we treat the installation of Royalwood™ Wallaba roofs as an art form rather than just a trade. When you want the beauty, durability and many other benefits of Royalwood™ Wallaba, make sure you get the best of the best to install your new roof: service professionals who know how to get the best possible results. There is a minimum order requirement for some of our products. For curved Cedar shingle orders, the minimum quantity requirement is just one (1) box. For Fancy-Cutt shingles, the minimum order is five (5) boxes. 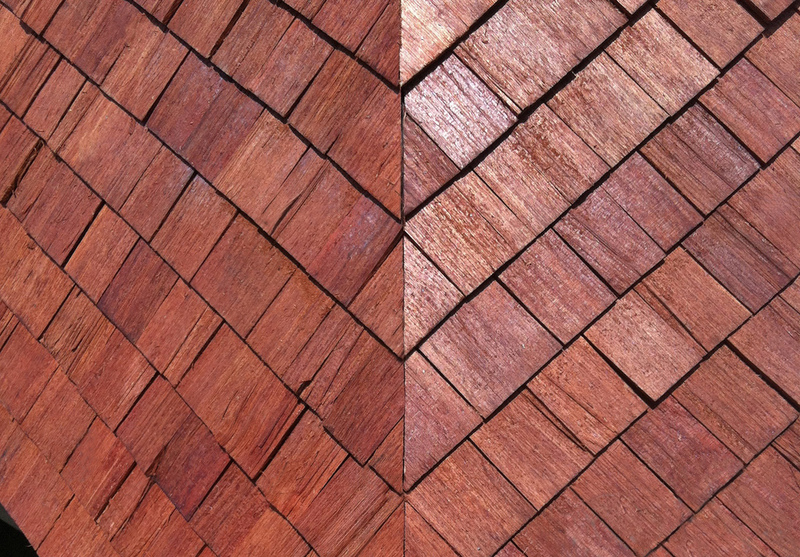 Depending upon current inventory, our minimum order for Wallaba shingles and Teak shingles is generally 2,500 SF. Please contact us for additional details. You rarely see custom Wallaba shingles and shakes in the United States. This can be attributed to three reasons. First, it’s hard to find. It grows in tropical forests and there’s simply not much of it in America. Second, it’s more expensive to buy and install than most other roofing materials. It lasts longer and often delivers long-term savings and greater value than more traditional roofing materials, but homeowners are often enticed by the lower initial cost of other materials. Finally, there’s a significant shortage of roofing professionals who understand Royalwood™ Wallaba and who can install it confidently and in a way that achieves outstanding results. But specialty Wallaba shakes are an incredibly attractive option for homeowners who want the best in roofing materials. The color of decorative Wallaba shakes can’t be matched with more traditional materials, which is why homeowners with Royalwood™ Wallaba roofs have incredibly unique curb appeal that is head-turning in its attractiveness. And Royalwood™ Wallaba also lasts decades longer than most traditional roofing materials. You may pay more upfront, but Royalwood™ Wallaba is a material that even sometimes outlasts the rest of the house. And, best of all, there’s little maintenance required when you choose a roof made of Royalwood™ Wallaba. Even other premium wood roofs (like cedar) may require additional treatment for moisture and mold as well as regular maintenance to keep it looking fantastic. But that’s not the case with Royalwood™ Wallaba. It’s durable enough to stand the test of time and it ages beautifully. Royalwood™ Wallaba has an exotic quality and often fits best on homes that have that same exotic look and feel. For that reason, you often see Royalwood™ Wallaba in hotels, resorts and villas in exotic locations like the Middle East, the Caribbean and even right here in the United States. That’s not to say that Royalwood™ Wallaba won’t be a good fit for your home if it’s not in one of those locations. Each home is unique in its own way, and each deserves a unique roofing solution. At Custom Shingles, we do more than just provide premium shakes and shingles and outstanding installation. We serve as a trusted advisor to our clients throughout the process. When you work with Custom Shingles, we provide a free and comprehensive estimate before work begins on your roof. We can also provide an inspection of your existing roof, design support and guidance and much more. Our goal is to ensure that you get a custom roof that best matches your vision for your home and that best complements its existing architecture. When you ask questions, we have answers. When you need guidance, we have recommendations. 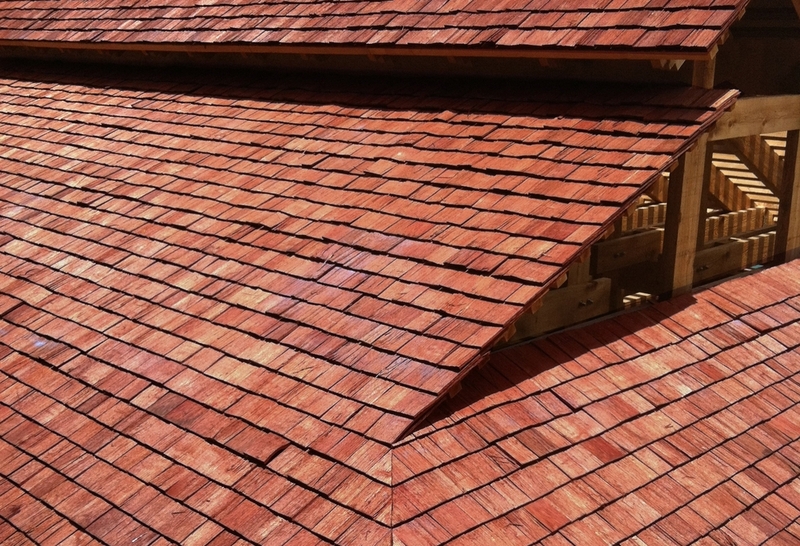 You can lean on the team at Custom Shingles throughout the design and installation process. You can and should expect the very best from Custom Shingles, because that’s what we expect from ourselves. As noted above, Royalwood™ Wallaba is an exceedingly rare material to use in roofing and we’ve pushed ourselves to become the best at installing it. You can’t find just any roofer to work with Royalwood™ Wallaba, and we can assure you that you won’t find a better source for service than what you’ll find at Royalwood™ Wallaba. We are the premier installers of Royalwood™ Wallaba and we come to each project with the necessary knowledge, experience, tools and resources to get the job done right. And we see each job as more than just a job. Rather, we see each job as an opportunity to create outstanding results and to help a home truly reach its full potential. Most of our clients care for beautiful and historic homes, and we see installing a Royalwood™ Wallaba roof on these beautiful and historic homes as an incredible responsibility. We take that responsibility seriously and we do everything we can to ensure that your vision for a Royalwood™ Wallaba roof becomes a reality. We can also provide support when you need to replace existing historic Wallaba shingles. It's been more than 35 years since Custom Shingles first began providing custom wood roof and siding solutions to owners of homes with the historic qualities that predispose them to premium roofing. We learned a lot through our nearly four decades of service and we’ve developed the tools, knowledge and resources needed to see that your vision for a premium roof becomes a reality. We can help you identify the perfect material to meet your needs, whether Royalwood™ Wallaba or another premium wood that we use for unique roofing. You won’t find a provider who knows more about choosing and installing custom wood roofs made of Royalwood™ Wallaba and similar materials than what you’ll find at Custom Shingles. We are equally comfortable replacing existing historic Wallaba shakes. We see our work as far more than just a job or a trade. We see the installation of Royalwood™ Wallaba roofing and roof solutions of similar materials as an art form. When we see your existing roof, we view it as a campus onto which we paint an incredible masterpiece: something that enhances the overall look and feel of your home and something that makes you fall even more deeply in love with where you live. We've realized since we first started our work in 1982 that few roofing professionals have the experience, knowledge and skill needed to properly install a premium roof made of Royalwood™ Wallaba. You’re never alone in your mission to select and install the perfect material for your wood roof. At Custom Shingles, we provide free estimates before work begins, we provide support throughout the design phase, we assess your existing roof, and we do so much more — all with a focus on seeing you completely satisfied with the final results, whether that’s a roof made of Royalwood™ Wallaba or another premium material. When you’re ready to explore the possibility of a roof made of Royalwood™ Wallaba, we’re ready to help. Use the form below to request your free estimate and we’ll be in touch as quickly as possible with the information you need. In the meantime, be sure to see the section of our portfolio dedicated to Royalwood™ Wallaba. These photos may spark ideas or serve as a creative outlet as you think through what you want your home and its roof to look like. Fill out the same form if you need to replace historic Wallaba shingles and shakes.